Rev. Osagyefo Sekou has published an essay on Truthout.org about Martin Luther King’s prophetic speech, ‘A Time to Break the Silence,’ at the Riverside Church exactly one year before his death. “A nation that continues year after year to spend more money on military defense than on programs of social uplift is approaching spiritual death,” he said. Sekou examines how Dr. King’s conscience developed about our involvement in the Vietnam War, from 1965 onward, through the Watts riots a few days after President Johnson signed the Voting Rights Act, his visit to Los Angeles and subsequent move to Chicago in his quest to understand urban poverty and offer alternatives to violence. 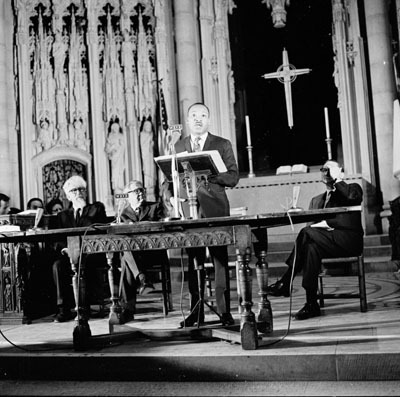 On June 25, 1967, King preached at Victory Baptist Church in Los Angeles. “We aren’t merely struggling to integrate a lunch counter now,” he said. “We’re struggling to get some money to be able to buy a hamburger or a steak when we get to the counter,” King boomed from the pulpit. King’s prophetic warning concerning spiritual death has come to pass. In the past decade, the triplets of evil are embodied in correlating events: Hurricane Katrina (racism), the Iraq War (militarism), and the fiscal crash of 2008 (materialism). To make matters worse, Citizens United and the recent Supreme Court decision striking down limits to campaign contributions may be the last gasp of the American empire, signaling the trump of materialism over democracy. Please read the full essay here.